Additional Info: Ben Eames is a classical pianist based in Central Scotland, UK. In september 2015 Ben attained a Masters of Music in piano performance at Trinity Laban Conservatoire of Music and Dance studying under Douglas Finch. Ben is currently focused primarily on 20th century and contemporary solo and ensemble repertoire. 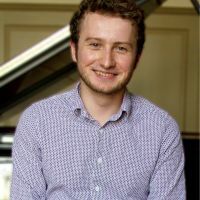 During his time at Trinity Laban, Ben also worked with the Wren Ensemble performing a chamber reduction of Gustav Mahler’s Symphony No. 4 as well as other ensembles. In July 2014, Ben graduated from the Ian Tomlin School of Music in Edinburgh Napier University with a 1st class Bachelor of Music with Honours studying under Simon Coverdale. During his time at Napier Ben worked extensively with various ensembles performing both classical music ranging from romanticism to 20th century and contemporary popular music. He also frequently worked in collaboration with fellow student composers as part of various concerts and workshops. In November 2013, Ben performed Mozart’s Concerto in C Major No.21, K.467 with the Edinburgh Napier Chamber Orchestra. Whilst at Napier Ben won multiple prizes at the Edinburgh Competitions Festival and performed extensively throughout the Edinburgh and Central Region area of Scotland in venues such as The Queens Hall, Edinburgh; Albert Halls, Stirling; Stockbridge Parish Church, Edinburgh and the Edinburgh Society of Musicians. Whilst Ben is currently focussed on 20th Century and contemporary classical music his entire repertoire is diverse, ranging from baroque through to romanticism as well. Furthermore, he is also invested in the academic study of music and applies extensive research to his approach to practice and performance style.